AFC - 11/09/05 Horses in the 21st Century?!? 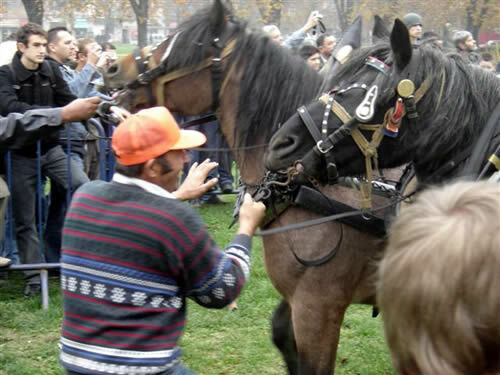 Animal Friends is complaining about the exploiting of horses in an experiment which is going to take place on the French Republic Square on November 9, at the occasion of the World Year of Physics. Horses are brought to center of the city so they could try to separate the two pieces of a half-sphere, with six of them pulling at the one side and the other six the other side of the half-sphere. 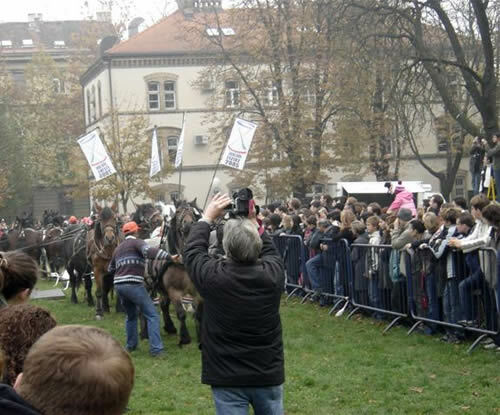 Although Otto von Guericke performed this experiment with the horses in 1654, it is not in the spirit of the civilization of the 21st century to revive this experiment by using horses, especially if one considered that there are many vehicles which could serve this purpose. As an animal rights and protection organization, in our opinion there is no need to use horses for this experiment, to exploit them for promotional purpose or expose them to stress. This kind of abuse deserves condemnation.